Two variants of this product provide large capacity and highly efficient air wipes for use with cables and extruded materials up to a maximum diameter of 150mm. a) Maximum wiping action with modest air consumption because the vertical posts from which the air is directed to the cable can be positioned to suit the cable diameter, and the slit length through which the air is discharged can also be adjusted. Since air consumption varies directly with the slit length, the shorter the slit and the smaller the cable diameter, the lower will be the air consumption. b) Low noise levels whilst operating at high wiping efficiency. Tests show that when operating in the open, they more than meet Occupational Safety and Health Act limitations, and Health and Safety at Work Act, for 85Db max at a distance of 2 metres. The air wipe is installed in the water catch box at the end of the extruder water trough, and is supplied configured so that the cable travels through the airwipe after passing over the roller. If the user wishes to reverse the configuration, the direction of the air jets needs to be changed to oppose the water. This is readily achieved by turning the vertical spindles,and relocating the pegs in the alternative locating holes. The large hexagon nuts at the bottom of the spindles will release the spindles from the swing arms. The air wipe comprises a fabricated main frame which carries a cable support roller, and two swing arms fitted with vertical post type wiping heads. On the under side of the frame are spring loaded plates with finger operated clamping nuts for quick positioning of the wiping heads. The vertical posts or spindles are fitted at their lower ends with air connections to receive nylon supply tubing, and have a series of air jets directed at an angle to the cable or material to be wiped. The wiping heads are hollow sleeves which fit closely over the posts and have four longitudinal slits of different lengths through which air is discharged, the sleeves can be rotated and locked in position by winged nuts to allow air to pass through one only chosen slit to suit the diameter of the cable to be wiped. Because air wipes operate in a wet environment, the main frame, swing arms and spindles are manufactured from stainless steel, and other components are of brass or plastic material. The cable or tube to be wiped is supported through the air wipe on the concave under roller. Finger-operated clamping nuts underneath the unit enable the wiping heads to be swung and locked in position providing whatever clearance is required on the cable. With the air flowing through the air wipe, rotate the sleeves to allow air to pass through the smallest or appropriate slit to remove water from the cable. If the air supply is dirty, occasional clogging of the wiping slits may occur. These can be cleared with a thin blade after first removing the sleeves from the spindles. 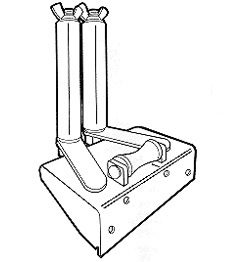 Air connections are provided to each wiping head spindle for the fitting of flexible nylon tubing. The air pressure and consumption is wholly dependent upon the extrusion diameter and linear speed, and the degree of wiping required.